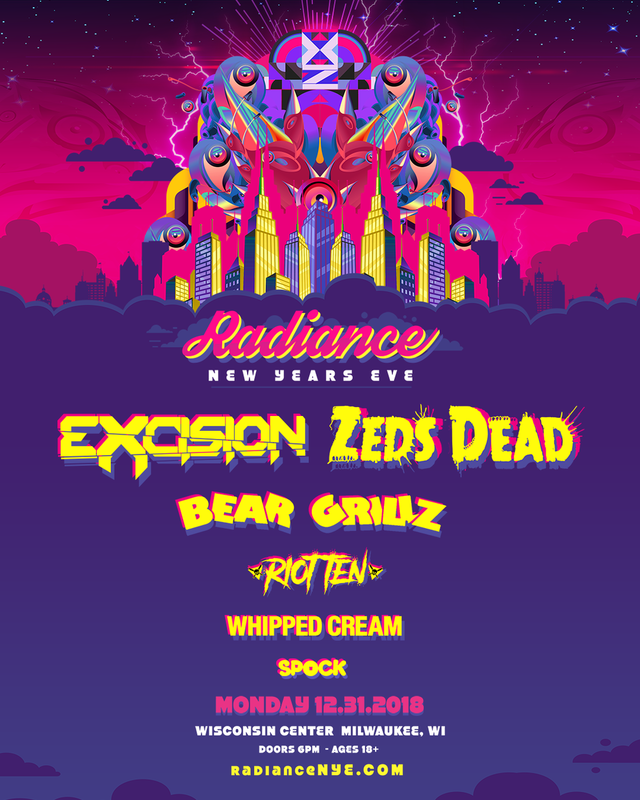 RADIANCE NEW YEAR'S EVE Featuring... EXCISION, ZEDS DEAD + MORE! Known for touring with massive sound systems and huge visual productions, headliner EXCISION will bring his signature bass-heavy, metal and hip-hop blended sounds to the Wisconsin Center on New Year’s Eve. EXCISION’S fourth full-length studio album Apex was released in August on his own label, Rottun, to critical acclaim. Stream it HERE. Toronto duo and co-headliner ZEDS DEAD will also bring their bass game to RADIANCE NYE. ZEDS DEAD has more than a decade of experience on the Dance Music scene and is known for bringing up fresh talent throughout their global tours. On September 7, ZEDS DEAD released a new single “We Could Be Kings” with DNMO on their own label, Deadbeats. Stream it HERE. Follow RADIANCE NYE on Facebook, Twitter, and Instagram for the latest news and announcements.